SINGAPORE, Jun 11 2014 (IPS) - China’s early-May decision to dispatch the state-of-the-art oil rig, HYSY981, into Vietnam’s 200-nautical-mile Exclusive Economic Zone (EEZ), has intensified ongoing territorial disputes in the South China Sea, raising fears of uncontrolled military escalation in one of the world’s most important waterways. It wasn’t long before Vietnamese and Chinese maritime forces were locked in a dangerous naval standoff, which led to low-intensity clashes in the high seas. China’s unilateral action sparked outrage across Vietnam, paving the way for unprecedented anti-China protests, which snowballed into massive destruction of foreign-owned factories, principally owned by China and Taiwan, and the exodus of thousands of Chinese citizens to neighbouring Cambodia. The whole episode undermined years of painstaking negotiations between Hanoi and Beijing aimed at peacefully resolving bilateral territorial disputes across the South China Sea. Shortly after, the Philippines also released photos suggesting Chinese construction activities on the Johnson South Reef, a disputed feature that falls within the Philippines EEZ in the Spratly Island chain in the South China Sea. Later, China confirmed that it was indeed engaged in reclamation activities on the disputed reef, but it tried to justify it by claiming it exercised “indisputable and inherent” sovereignty over the said feature based on Beijing’s notorious “nine-dash-line” doctrine, which covers almost the entirety of the South China Sea. The Philippines and Vietnam contend that China has flagrantly violated the 2002 Declaration on the Conduct of Parties in the South China Sea, which explicitly discourages claimant states from unilaterally altering the status by engaging in, among other things, construction activities on disputed features. Alarmed by the intensifying territorial disputes between China and other claimant states, the Association of Southeast Asian Nations (ASEAN) expressed “serious concern” and called for a rule-based, peaceful resolution of the disputes. Expecting a more vigorous response from ASEAN, Vietnamese and Filipino leaders called for the swift finalisation of a legally-binding Code of Conduct (CoC) in the South China Sea, and vowed to forge a bilateral “strategic partnership” to counter China’s territorial assertiveness. Meanwhile, other Pacific powers such as Japan and the U.S. have also stepped up their criticism of China’s recent actions, underscoring their direct national interest in preserving freedom of navigation in international waters. “Whatever construction China carries out on the [Johnson South] reef is a matter entirely within the scope of China’s sovereignty,” argued China’s Ministry of Foreign Affairs Spokeswoman Hua Chunyin, dismissing protests by Filipino officials. Confronting an increasingly assertive and powerful China, the Philippines and Vietnam have moved closer to a genuine alliance. On the sidelines of the World Economic Forum (WEF) on East Asia in late-May, Philippine President Benigno Aquino III and visiting Vietnamese Prime Minister Nguyen Tan Dung agreed to forge a bilateral strategic partnership, with a particular focus on maritime and defense cooperation vis-à-vis the ongoing disputes in the South China Sea. “We face common challenges as maritime nations and as brothers in ASEAN,” declared Aquino during his meeting with his Vietnamese counterpart, underscoring Manila’s desire to establish a closer partnership with neighbouring countries. “More than ever before, ASEAN and the international community need to continue raising a strong voice in protesting against [China’s territorial assertiveness], securing a strict observance of the international law, and peace and stability in the region and the world,” lamented Dung, underscoring Hanoi’s urgent desire for the multilateral resolution of the ongoing disputes. Recognising China’s military superiority, and the inefficacy of existing diplomatic mechanisms, both the Philippines and Vietnam have been looking towards external powers such as Japan and the U.S. to counter China’s territorial assertiveness. Much of Asia’s trade and energy transport passes through the South China Sea, and there is a growing fear that ongoing territorial disputes will spiral into a prolonged, destructive conflict, which could affect all regional economies. Influential actors across the region have been desperately searching for new mechanisms to deescalate ongoing territorial tensions, preventing claimant states, primarily China, from undertaking any destabilising action. “Japan intends to play an even greater and more proactive role than it has until now in making peace in Asia and the world something more certain,” declared Japanese Prime Minister Shinzo Abe in the recently-concluded 13th Shangri-La Dialogue in Singapore, which brought together leading defense officials, experts, and journalists from around the world, and saw spirited exchanges between top officials from Japan, the U.S. and China. During the high-level gathering, Abe, the keynote speaker, sought to present Japan as a counterweight to China, with Tokyo relaxing its self-imposed restrictions on arms exports, increasing its defense spending, and seeking new ways to expand its security role in the Asian region. “We take no position on competing territorial claims [in the South China Sea]… But we firmly oppose any nation’s use of intimidation, coercion or the threat of force to assert these claims,” argued U.S. Defense Secretary Chuck Hagel, underscoring Washington’s growing alarm over China’s territorial posturing in the Western Pacific. Under a new nationalist government, led by Prime Minister Narendra Modi, India is also expected to play a more pro-active role in the region, given New Delhi’s growing trade with East Asia and its large-scale investments in the hydrocarbon-rich areas of the South China Sea. 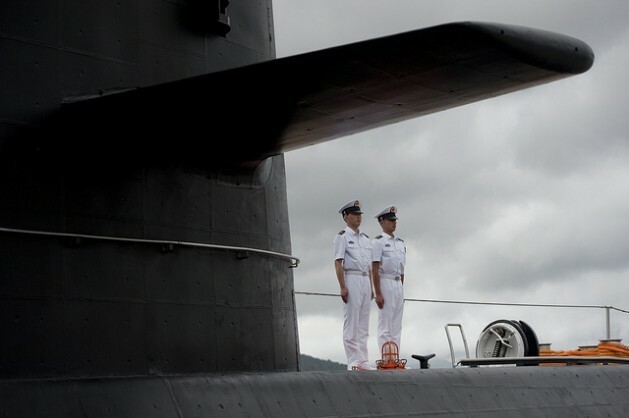 The U.S.’ treaty allies such as Australia have also stepped up their efforts at containing China’s rising territorial assertiveness, as the two Pacific powers deepen their naval interoperability and defense cooperation. Overall, it seems that China’s rising assertiveness has encouraged a flexible counter-alliance of like-minded countries, which are heavily concerned with the economic and geopolitical fallout of the brewing conflict in the South China Sea. It remains to be seen, however, whether China will relent on its territorial claims amid growing international pressure.